They Got Me Over A Barrel: Syston pub undergoes £320k makeover YAY! Syston pub undergoes £320k makeover YAY! 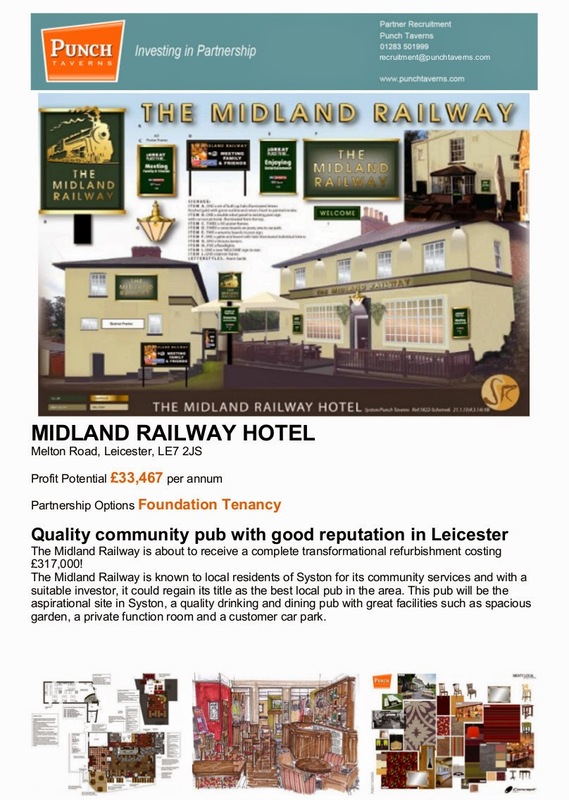 This article is about The Midland Railway in Syston which, interestingly enough, seems to be on the market... I wonder whether Jane, the landlady knows that. Anyway. Punch do comprehensively unimaginative refurbishments, that make all the pubs they've treated look like the same pub. it's very clever really, making a pub, whether its' red brick under slate or half timbered with thatch. look like it's part of the same anodyne chain concept when they are run by individual entrepreneurial publicans paying a pubco for a low cost entry into their own business... Magic, it is, and all part of the #GreatBritishPubcoScam. I've become adept at spotting these refurbishments a mile off. This is a joint investment so the tenant will be paying for all new f&f from kitchen equipment to glasswasher and ice machine and TV screens and for surface decorations from paint and wallpaper to carpets while Punch will be responsible for structural. It's likely to make the pub busier. Whichever way it's done the rent will be higher than it was before the job - Punch expect to get all their money back and much more - on top of their previous profit grabbing position that persuaded the tenant to go the whole hog with them now. Licensee Joanne Abbott said: ... "it will give it a fresher look" - for £320K I should CoCo Jane. 'The pub is expected to re-open in mid September.' Wonder who's paying for loss of trade and no income for 8 weeks or so? “The pub has needed investment for some time and we want to give the community the pub they deserve." thinks: "(we're not really 'giving' the community anything at all, we project a 22% Return on Investment out of this job)". At head office in Punch Towers it's trebles all round - oh, and its' their tied tenant who is paying... for all their rounds. I suppose the tenant has the advantage of knowing the details of the deal to which she's signing up, rather than surmising what the deal might be. It may be a terrific deal, it may be a terrible deal - but she's chosen to go with it, and good luck to her.